I thought it might be interesting to share what a day of our boat-based life looks like. Yesterday was then perfect example of a challenging, get-things-done kind of day. At times absurd and frustrating, it was the epitome of why I tell people this lifestyle isn’t all relaxing sandy beaches. 3am Gunnar wakes me up. He’s hungry. I roll over and feed him in the vberth. The hatch above me has been dripping rain on me all night. There are huge wet spots in the middle of the bunk under the hatch so Gunnar and I each sleep on an edge. 5:30 Gunnar wakes up, eats, and is up for the morning. He’s his usual cheery self at this time, making it hard for me to go back to sleep because I don’t want to miss anything. I doze on the bunk next to him. Lee gets up and makes himself an instant coffee. 6:30 I get out of bed and head to the galley to make breakfast while Lee, changes G. Lee has eggs and last night’s leftover lentils. I have oatmeal. It’s moist and cool but not really raining any more. 8 We gather our things to go ashore for showers, laundry, grocery shopping, and checking email. I feed Gunnar again now that he’s taken his mini morning nap. We wouldn't be able to do this without the car seat. 9 Yes, it takes that long to get ready. We cram into the dingy (baby in car seat, laundry, stroller, 2 adults and their respective bags) and find a place at the very crowded dingy dock. I almost fall in while trying to get out of the boat. 9:15 Everyone else is in the Yachtsman’s building doing laundry and showering. Grr. I wait in line and shower while Lee watches the baby. We decide to explore other options for laundry and head to the nearby farmers market instead. 10 I buy some lovely produce from the vendors. I’m pleasantly surprised by the market. 10:30 Search for the laundromat in town. Find it under the small grocery store. The stroller won’t make it down the stares so Lee waits outside with Gunnar while I start a couple loads. Then we look for a cafe where we can use then internet while we wait. 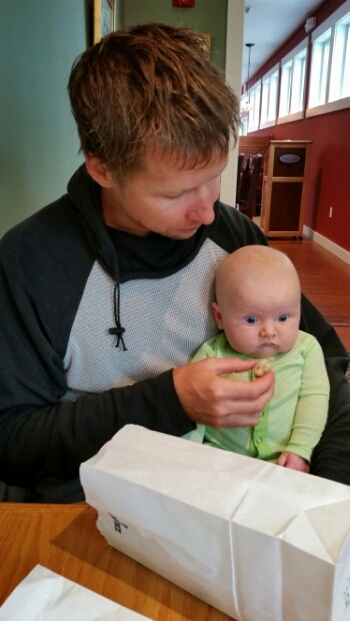 Mmm donuts are not for babies. 11 By the time we find a place, order coffee and a donut and sit down Gunnar is getting crabby. Lee walks him outside with the stroller. 11:30 I need to go put the laundry in then dryer but Lee is nowhere to be found so I carry all our bags down the street. People are hogging the dryers at the laundromat so I can’t do anything with our clothes. In find Lee when I get back to the street and we go back to the harbor to look for a place I can sit to feed G.
12pm I feed Gunnar and Lee and I each scarf down a PB sandwich at a picnic table. We decide that the best thing to do is for Lee to take the baby and stroller to hang out in the visitors center while I go finish the laundry and get some supplies at the store. 12:30 Still a blockade at the dryers so I take someone’s dry clothes out of one and start mine. I grocery shop while the dryer runs and then bring the food back to Lee, saying I’ll meet him at the dingy dock in 15 minutes. 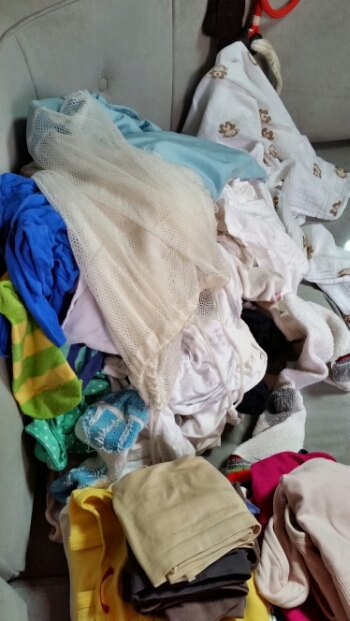 1 Clothes aren’t dry but I know Lee is waiting so I throw them all in a bag and head back to the harbor. Lee does 2 trips out to Pirat to get everything aboard. We catch our breath for a little while on the boat. It has been foggy and rainy all day but now the sun is coming out. 2 We motor over to the fuel dock to get diesel and water. 3 Lee decides he wants not go for a run. I want to finish drying my clothes. Its not sunny enough for them to dry on the lifelines and I don’t have any clothespins. 3:45 We’re back at the Yachtsman’s building. I hang out there with Gunnar, who is very popular with the cruising grandma crowd. Lee runs 9 miles on a trail while I dry the laundry. 5 Lee showers and we cram back into the dingy to return to Pirat. 5:30 I make dinner while Lee keeps the baby entertained. We eat, I feed Gunnar and he falls asleep. 6:30 I do the dishes while Lee tends to Gunnar, who has woken up. 7:15 We finally get him to stay asleep. 8:15 I crawl into the v berth with G to sleep. As you can see, we accomplished a lot despite the crappy weather and various complications. Still, it was a frustrating, exhausting day. Heading downeast in the fog. Now we’re 30 miles or so Downeast (up the coast) and about to make our passage to Canada. We meet Lee’s family near Machias so they could deliver some parts and drive us to a real grocery store. Somehow I ended up under provisioned for this trip and we were running out of supplies fast. Now we’re all stocked up and ready to face the much more barren, wild coastline between here and some larger Canadian ports. I’m not sure how our phones will work or where we’ll find internet so posting may become even more sparse than it has been. For now, Grand Manan here we come! wow, what a day! 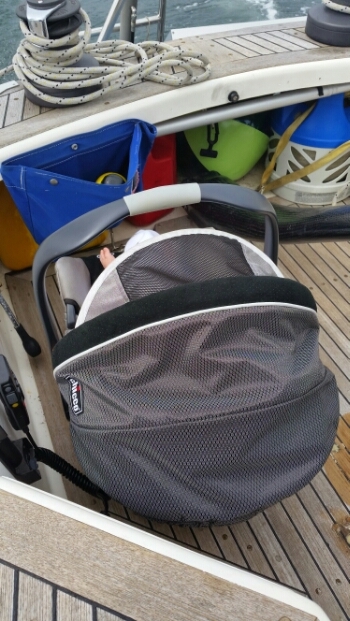 Love the description of how to accomplish basic chores while living on a boat…..with a baby.